Full of simple and fresh ingredients, it’s the perfect side dish for your next cookout, an easy option for a weeknight dinner, or a refreshing make-ahead lunch option. 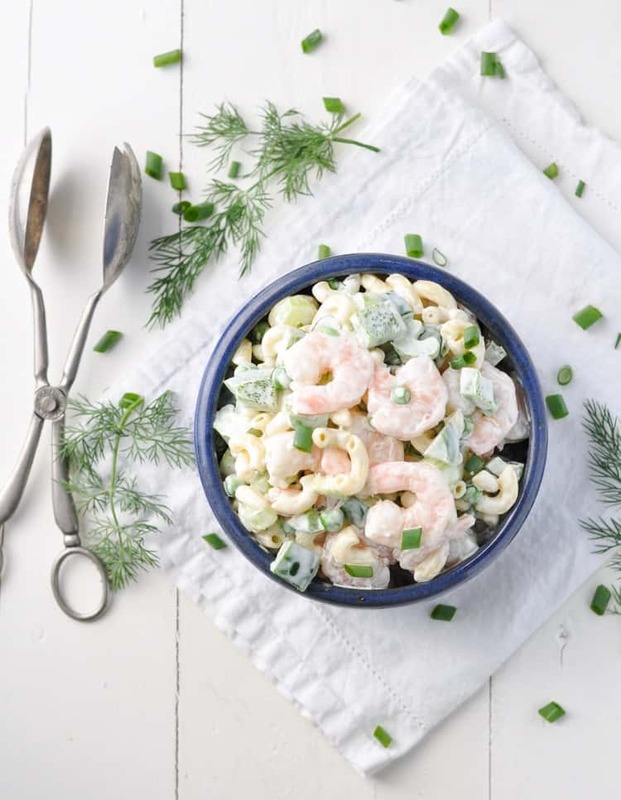 Full of simple and fresh ingredients, Aunt Bee’s Shrimp and Pasta Salad has been a family-favorite for decades! It’s the perfect side dish for your next cookout, an easy option for a weeknight dinner, or a refreshing make-ahead lunch option. This multi-tasking recipe will soon become a regular in your kitchen as well! 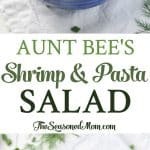 This recipe for Aunt Bee’s Shrimp and Pasta Salad was originally published in June, 2015. The photos were updated in May, 2017. 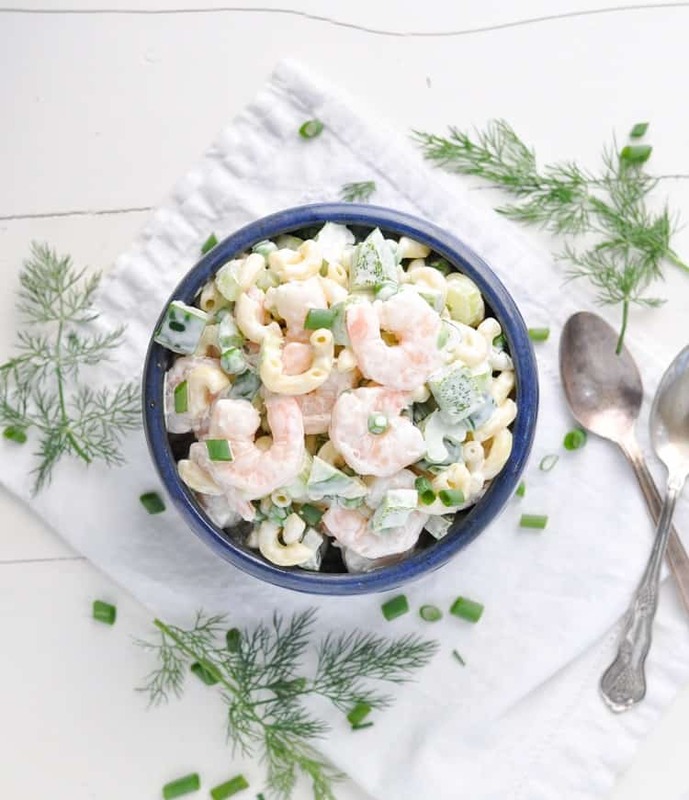 This passed down shrimp and pasta salad is one of my go to summer recipes when I want something comforting, delicious and easy to throw together. It’s incredibly simple yet always hits the spot plus there’s no cooking involved so it’s perfect for those sweltering hot days. With the right amount of crunch and creamy textures it’s so easy to adapt with your favorite herbs and veggies! My mom’s godmother, Aunt Bee, is a fine Southern hostess in the best sense of the term! She has served holiday meals, cocktails, and lunches to our friends and family for as long as I can remember, and her dishes always garner rave reviews. She has a knack for preparing simple, classic dishes in a delicious way. She knows which ingredients work best together, and she also knows some genius shortcuts to keep prep time in the kitchen minimal. Isn’t that what we’re all looking for? Over the past year, Aunt Bee has been sharing treasures from her past (and present!) with me — including fond memories of my grandmother (her best friend), her family’s holiday traditions and keepsakes, and some of her most treasured recipes. I love the process of recreating Aunt Bee’s classics in my own kitchen so that I can share the tastes and stories with my children. These meals are a connection to the past that will be carried on for generations. And let me tell you: these recipes have become family favorites for a reason…they are all absolutely wonderful! This Shrimp and Pasta Salad is not fancy, but it’s an option that everyone loves and that disappears fast when you put it on the table. I especially love the variety of textures, from the creamy dressing to the crunchy vegetables and the tender pasta. Add in the fresh lemon juice and fresh herbs for the perfect refreshing zest! 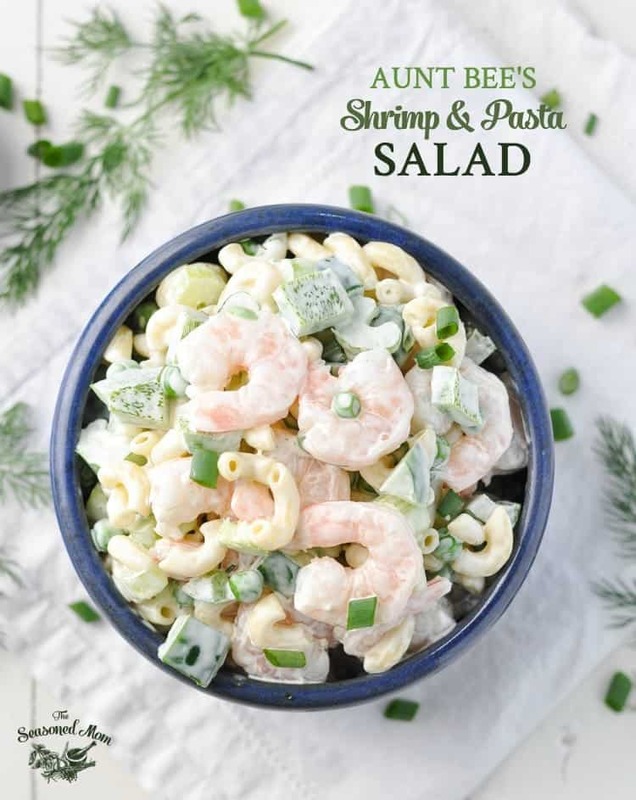 If you’ve tried this Shrimp and Pasta Salad or any other recipe on The Seasoned Mom then don’t forget to rate the recipe and leave me a comment below! You can also follow me on Facebook, Twitter, Instagram and Pinterest to see what I’m getting up to. 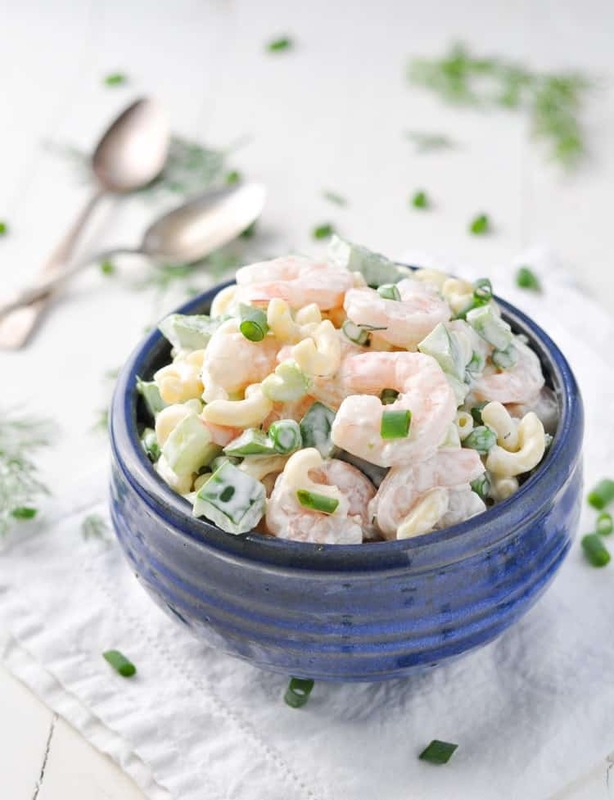 In a large bowl, combine shrimp, pasta, green onion, bell pepper, celery, and peas. In a small bowl, whisk together mayonnaise, lemon juice, vinegar, sugar, dill, salt, and pepper. Pour dressing over pasta mixture and toss until completely coated. Your Aunt Bee sounds just so sweet, and her pasta salad looks amazing!! Definitely grabbing & pinning the recipe to make soon!! Thank you, Anna! She is definitely a special lady! Oh MY! I have fresh shrimp, organic celery, dill etc. but not the frozen peas so I am going with what I have (I do believe this will be excellent when the fresh peas are in). So palate-pleasing simply to think of but I HAVE TO GET TO IT! Thank You (and I had a great Aunt Bea as well. Our Aunts lived in a very special time to have their complexly simple knowledge about ways of living well is treasured. For generations. Yay! I’m so glad that you’ll give it a try, Krista! Adapting the recipe to suit your kitchen and tastebuds is great! I really detest dill. Any suggestions for a substitute? I tried this today and it is killer! I substituted cucumbers vs. peas and added parsley and some Slap Ya Mama Cajun Seasoning! It was a major hit in my house! Definitely a go-to for barbecues! Yay!! I’m so glad that you liked it, Kelsey! Thanks for letting me know! It’s definitely a favorite in our family, too. I’m glad that summer’s here and I have an excuse to start making it again! This recipe was yummy! Would definitely make again. Yay! I’m so glad that you enjoyed it, Beverly! Thanks for letting me know! The 8 oz pasta is mesured cooked or not? Hi, Monica! The pasta is measured before cooking (dry weight). Enjoy! Can I ask where you got that bowl? It’s so pretty! Hey, Maggie! It’s from Target. 🙂 I got it about a year and a half ago, though — so it might not be there anymore. They have plenty of other great white options, though…definitely check it out! THAT IS NICE I LIKE THIS. I was wondering if you could make this ahead. I am always looking for a new recipe for our deli lunch options. How long can you keep in in the fridge. 3 days? I really detest dill. Any ideas for a substitute? Oh this pasta salad looks so good! I don’t think I’ve had a shrimp version before, so I’m loving this fun twist. What a great recipe to honor your Aunt with! I came by via Google after trying to find a ‘”Classic shrimp & pasta salad” like my grandmother used to make. This reads as close as I can recall, though she used shell pasta and fresh or frozen baby peas. Thank you for posting this! Delicious. I made this for a ladies who lunch a lot luncheon and it was a big hit. So versatile. I omitted peas, didnt have any. You could add so many things and take it in any direction but is wonderful as is. Thank you. Awesome! Thank you, Deb! I’m so glad to hear that it was a success! I’ve been making this for the past three summers!!! I absolutely love the combined flavors…. especially the shrimp!! Potato salad is great but this salad is fast and easy and it never gets old!!! Bravo!!! Oh, that makes me so happy to hear, Julie! Thank you SO much!!! Looking for simple recipes to take to church Homecoming Sunday pot luck lunch. Like that Aunt Bee’s Shrimp-Macaroni Salad & Dump & Bake Chicken, Broccoli and Rice Casserole recipes are adaptable to tastes and use ingredients in most pantries and fridges. Plus, you can cut to smaller portions. Glad I found this site. I will be subbing Red and Yellow Bell Pepper in salad. Will be back with ratings. Great! Let me know how they turn out, Meg! 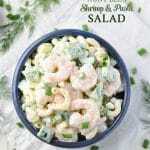 I was looking everywhere for my Shrimp Pasta Salad recipe from an old Southern Living cookbook! This is it!! Thank you, it was always a big hit, just forgotten for a few years. Wonderful! I didn’t realize that Southern Living was the original source of this recipe. So glad that you can enjoy it again! I just made it for the first time and I found that the pasta to shrimp ratio wasn’t enough for me so I would increase the shrimp to 1 1/2 lbs and decrease the celery to 1 1/2 cups. I would also do a mix of red and green bell peppers just to add some color to the salad. I had some leftover shrimp from a Christmas party and was looking for a classic shrimp salad recipe (like I remember from my childhood) and this was it!! So perfect. Thanks for sharing and now that I found your site I’m anxious to try some of your other recipes! That’s wonderful, Chris! I’m so glad that you found the recipe (and my site). Thanks so much for your note! I just made this recipe, but I tinkered some within the confines of the ingredients. I used tri color rotini rather than shells or elbows, orange bell pepper rather than green. I also made my dressing with mayo, lemon juice, dill weed, celery salt, parsley, lemon pepper and a small pinch of kosher salt. So, yes, I have all your ingredients, just looking a little different. I think I need to add just a bit more salt to the dressing, but otherwise it is very good, full of flavor, color and texture. It’s a keeper! Oh, and by the way, the site wouldn’t let me rate it. I’d give it a 4.5 out of 5.